Has it been too long since you saw “Serenity” in the theater? Unless you saw it earlier today, the answer is yes. Can’t Stop the Serenity is organizing viewing of the BDM to benefit Equality Now. Any Dallas area FB’s can catch it June 22 at the Studio Movie Grill, Dallas at 1pm. Tim Minear‘s going to be there. 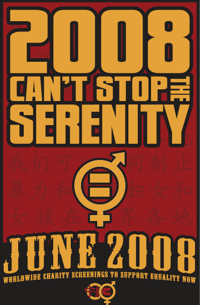 Posted in Comic Blog and tagged can't stop the serenity, firefly, joss whedon, serenity. Umm, they're doing screenings in Austin. Along with 55 sites total worldwide. I did last years in Dublin. 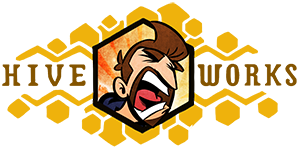 (Beer good. Beer with Irish Browncoats ever better.) See http://www.cantstoptheserenity.com for dates/locations. It's unfortunate I am located in New Zealand where something like this could never … ever … ever happen. Actually, I live about 2000 miles from there, so I shan't be attending. 🙁 Unless you know of a way to get free airline tickets? Buy lots of stuff with your credit card? Sorry, that's all I got. It doesn't matter where. It just matters that they aren't doing any showings near me. I'd tell you to organize a fan viewing of your own, but Universal typically frowns (legally) on fans promoting their properties for free. Do you fit in a suitcase? I think he's saying he'll be in Austin during the Dallas Show, and back in Dallas during the Austing show. its a lose lose.